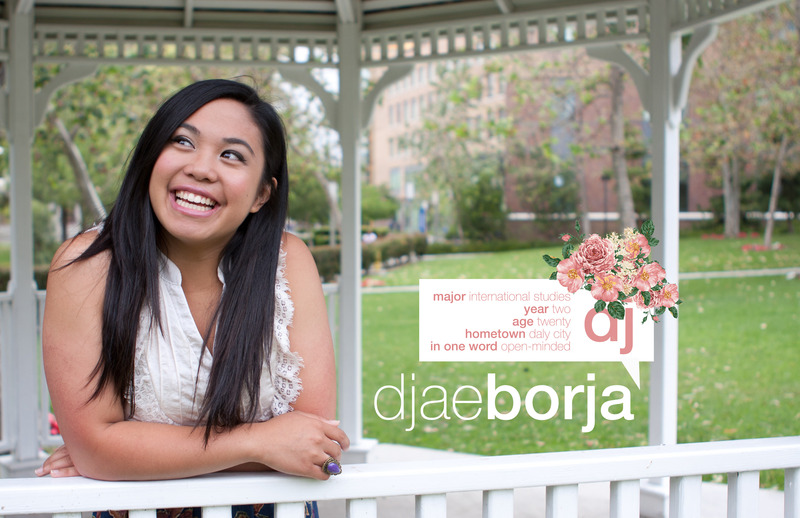 Djae Borja’s one word to describe herself also describes her passion, as her open-mindedness stems from education. She devotes her time to educating not only herself but everyone else around her, and encourages those people to continue to educate others, and really emphasizes cultural awareness. Even though Djae’s term on Kababayan board is ending soon, find Djae reaching out to the general members, as she is making sure they get involved and continue to come out to Kababayan next year. Through this, she’s influencing everyone with her love of Kababayan, and her love of UCI. Djae hopes to live abroad to get into community development. 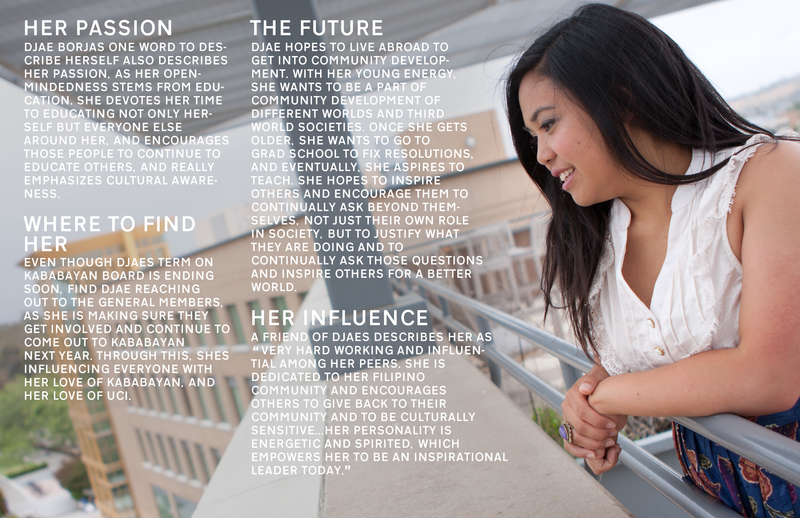 With her young energy, she wants to be a part of community development of different worlds and third world societies. Once she gets older, she wants to go to grad school to fix resolutions, and eventually, she aspires to teach. She hopes to inspire others and encourage them to continually ask beyond themselves, not just their own role in society, but to justify what they are doing and to continually ask those questions and inspire others for a better world. DB: I was born and raised in Daly City, CA, which is the border of San Francisco. Daly City is known as the Filipino capital, so growing up in that area, I didn’t actually identify with it, other than having the cultural food around me. When my dad’s side came from the Philippines, his family had already been tied to America, and so they didn’t emphasize that I learn about the Filipino culture, because they had their struggles. They pushed for me to learn about the things around me and to be adaptable. It wasn’t until here at UCI that I found my strength through my culture. That’s why now my position in Kababayan is the community outreach coordinator. Even though I didn’t know a lot about the Filipino culture, I understood how my culture gave me strength to at least be curious about other things happening around the community. What also influenced me is my education background coming from a struggling elementary to a very privileged high school- the experience of working with very little to experiencing an education where the surroundings, community and resources provided made education critical to who I am today. My experience from that motivates me today to promote quality of education not just in academia but the experience. Although I am just in the Kababayan community, I encourage my peers around me to learn more about the world around them in their immediate communities and in the world. DB: Coming in my first year, I wasn’t involved until last spring quarter, as an intern for Kababayan. It’s crazy to think that now a year later, I’m Kababayan’s community outreach coordinator. Just being in that position and also being an intern, I’m so involved on campus, not just through organizations, but just through building networks across different groups and spaces across UCI. What I hope to accomplish… there’s so many things I want to get out of UCI. I feel like it’s almost too short for how much I want to do. I want to build coalitions, not just among cultural organizations, but among academics, and also bridge the gap between external organizations as well, with outside influences. If I were to say one tangible thing that I want to accomplish, it’s to leave here influencing people to learn more and have that passion and drive. I don’t want to leave here for myself, but I want to leave here for people and my friends to continue asking themselves what else they can learn. KS: How have you been involved in the Asian Pacific Islander community? DB: Through Kababayan, in fall quarter, I was able to organize an event along with Alyansa called JFAV, a movement for Filipino veteranos, and that was the first time really connecting with my culture, community-wise. Recently we connected with our community by organizing a historic Filipino town field trip, just to reconnect, and we were able to outreach to the community there, and able to build those connections, and how different organizations want to see the youth. I’ve just been trying to provide that educational outlet. DB: Everyone. I feel like there’s not a single person or event, because I’m a person that’s really open-minded. I like to learn from different experiences, different people, and different stories. I would take into account the people that I have met ever since I was a kid. That includes my very first best friend, my parents, to even the people who I meet everyday. Everyone’s stories are different, and I learn from that. DB: I’m most passionate about education. I don’t think I would be where I am today without being open-minded and learning, not just through books, but through experiences and the people I connect with. That’s the best kind of learning, because things that are interactive and things that you apply in your education, if you supplement those together – it keeps you open-minded in a way of reasoning between different communities and different things that you do. KS: What is something interesting about yourself? DB: I have a motorcycle license. I actually drive a scooter, though. Why do I have it? Because I’m open to learning!